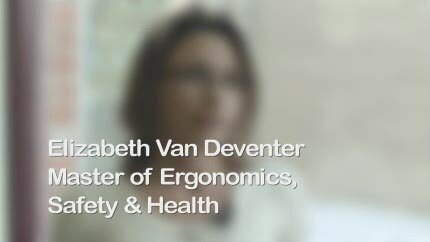 Why study ohs and ergonomics? You can study the Master of Ergonomics, Safety and Health online, if you live in or outside of Australia. This course is designed for people who wish to work at a professional level in the rapidly growing field of Occupational Health and Safety (OHS) with specialist coverage of Ergonomics. It is suitable for those already working in the field who need to upgrade their qualifications to meet new OHS professional practice requirements, as well as for new entrants. La Trobe designs its courses with your future career in mind and partners with a range of professional organisations for accreditation and registration. Refer to the detail for each course below to see what professional registration and membership options exist. The course is fully online, enabling busy professionals to combine study with other commitments. There are no compulsory attendance requirements and study is part-time (up to a maximum of 0.5 of a full-time load). As a La Trobe graduate you may be eligible for our 10% Alumni Advantage when you apply for a full-fee postgraduate coursework program. Demand for tertiary-level qualified OHS professionals is growing. Government regulators such as WorkSafe Victoria emphasise the need for employers to use qualified OHS professionals. This course is designed so that graduates will satisfy educational requirements for practice as both OHS professionals and as Certified Professional Ergonomists. You may be eligible for our student exchange program. View all the staff from the College of Science, Health and Engineering.